Abin Sur was a dirty old git. He used to play about quite a bit. There was a lady in Hong Kong. Plus one who looked like King Kong. Who had a tash that was made out of spit. Well, that is what these guys told me. Writer: Geoff Johns; Artist: Doug Mahnke; and Publisher: DC Comics in April 2012. 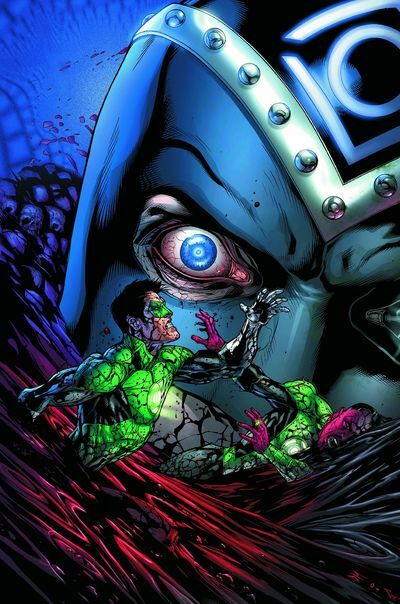 Whilst in the thrall of the Indigo Tribe, Sinestro recollects that he once banged Abin's sister before she snuffed it. As soon as Hal breaks free from his confinement, he bumps into one of Abin's old pals, Natromo, whom explains to him how Mister Sur formed this purple faction group in the first place. Plus why their formation was to topple the Guardians of the Universe. In the past, all the members of 'the Tribe' were once bad guys captured by Abin, and now have been 'woken up' by Natromo when hears some very bad news from Hal. 'Roughly translated to your language, "Nok" mean's "compassion be with you". Nok is also the name of our world, uneducated one'. Great! I am sure that this new 'chat-up' line of mine will work even better for me now! NOK! There were two aspects about this issue that I really did like. Firstly, even though this was an en exposition type tale, I enjoyed the fact that it did not come across as an exposition type tale. The Yoda like Natromo was a great device to relay the back-story via, because it gave this yarn some personality and flavor. Plus secondly, I liked Natromo. He is the type of wise doddery old character that I have wanted to see on this book for quite some time now. Please don't kill him off guys. I found it slightly hard to believe that Natromo did not know that Abin was dead, or that the 'Blackest Night' already happened. OK, I understand that he is a bit of a reclusive character. But I am afraid to say that this particular aspect about his personality wasn't expanded upon to gauge how reclusive. STORY: Listen, this may sound a bit weird, but I did get a kick when I found out that Sinestro had a fling with Abin's sister. It's like hearing Darth Vader had an affair with Obi Wan Kenobi's Foxy Auntie. Strange, yet intriguing somehow. ART: I did enjoy how the planet 'Nok' was presented in a very stark an earthy manner. It was as if this barren wasteland was designed by a Goth with a fetish for all things Aboriginal and purple. Moreover, the panelled pacing to this story was very tranquil in tone as well. Giving it that 'Silent Movie' flavor in places. NATROMO: Good or bad, as soon as I saw this pug faced shaman, I though of Mel Brooks in the film Spaceballs. No. Not President Skroob. Yogurt. The golden face dwarf that was one half used car salesman, one half maths teacher. Good match, right? ABIN'S SISTER: OK, so what pretty actress keeps on falling for the bad boys, huh? Yes. Correct. Winona Ryder. She is still as pretty and as versatile as she ever was. And I could see her painted from head to toe in... in... err... what colour is that, huh? Extreme Pink? Abin Sur Is At The Centre Of The Universe. Shame He's Dead. He Would Have Liked It. Overall I thought that this installment of Green Lantern was a marked improvement over the previous couple of issues. It had more character. It had more story. And it has made things a little bit clearer to where the story will be headed next. The Guardian's Of the Universe needs a spanking me thinks. Though who and how this spanking will occur is anybody's guess really. Maybe Natromo? That I would like to see.